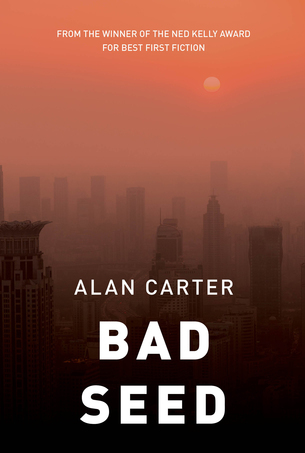 ﻿Crime Writer, Alan Carter was born in Sunderland, UK and immigrated to Australia in 1991 where he lived in Fremantle with his wife Kath and son Liam. His first novel Prime Cut was shortlisted for the UK Crime Writers’ Association Debut Dagger Award in 2010, and won the Ned Kelly Award for Best First Fiction in 2011. The sequel Getting Warmer was released in October 2013. The third title in the series Bad Seed was published in March 2015. These three novels were published by Fremantle Press. Prime Cut has also been translated and released in Germany, Spain, and in 2016 in France. Getting Warmer will be released in Germany in 2016. Alan is currently working on a new crime fiction title from his new home near Havelock at the top of the South Island. In his spare time he also works as a television documentary director. Shortlisted for a 2010 Debut Dagger Award, Prime Cut is what crime reviewer Graeme Blundell calls a classily written story with ‘mordant wit and a fine sense of place’. Meet Cato Kwong – disgraced cop and ex-poster boy for the police force. Banished to the stock squad after the fallout from a police frame-up, Cato is brought in from the cold to solve the case of a torso washed up on the wild shores of the Great Southern Ocean. But Cato faces powerful opposition when his investigation lifts the lid on the exploitation of migrant workers and disturbs an even darker criminal mind. Cato Kwong is back. Back in Boom Town and back on a real case – the unsolved mystery of a missing fifteen-year-old girl. But it’s midsummer in the city of millionaires and it’s not just the heat that stinks. A pig corpse, peppered with nails, is uncovered in a shallow grave and a body, with its throat cut, turns up in the local nightclub. As a series of blunders by Cato’s colleague brings the squad under intense scrutiny, Cato’s own sympathy for a suspect threatens to derail his case and his career. When wealthy property developer Francis Tan and his family are found slain in their mansion, Cato Kwong is forced to recall a personal history that makes his investigation doubly painful. The killer is elusive and brutal, and the investigation takes Cato to Shanghai. In a world of spoilt rich kids and cyber dragons, Cato is about to discover a whole lot more about the Chinese acquisition of Australian land – about those who play the game and those who die trying. Still reading knowing that I should be fast asleep. An intricate plot with realistic characters. Well researched with sufficient description to satisfy placing and atmosphere but not over-done. After a good sleep, looking forward to the next Cato (mis)adventures. Great crime thriller you won't be able to put down. This is the 3rd book by Alan Carter that I have read about Officer Philip Kwong. The books just keep getting better. This one was full of action, a little blood thirsty at times, really pacey and I found it hard to put down. Love the author's humour and his ability to make the characters real. Great read, highly recommend it and can't wait for the next installment.